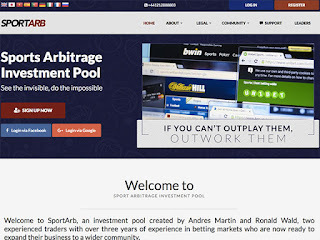 Today I am going to take a look at one of the previously reviewed projects - Sport Arbitrage. If you haven’t heard of it yet, you can read my first article about it here, in order to have a better insight what I’m going to talk about. Why bother writing about a comparably old program, especially if it has been online for more than 50 days, right? It’s uniqueness at the time when it was launched and longevity made me curious to take another look at it and see what’s their story and where they are heading! At first glance Sport Arbitrage presence in social media looks impressive – 21,5 thousand followers on Twitter and 11,5 likes on Facebook. Even though numbers seem huge, there are 7 posts on Twitter, which seems very strange. In fact, one of these posts is about International London Tattoo Convention. It just doesn’t ring a bell for me as a potential investor. Yes, I understand, we all want to make some shortcuts, but 21,5 followers for 7 posts seems way too much a shortcut. At least the profile in Facebook seems more realistic considering posting frequency and post engagement. The website had a huge increase of Alexa Rank since the launch of the program. It has had an increase by 8,243,290 positions in the Global rank, which is quite impressive in such a short time. Sport Arbitrage has currently 3,614 Alexa rank in the United States. I believe the reason for such impressive results might be planned or natural off-page SEO activity. Alexa bar report shows at least 1600 links pointing to the website. Of course, any promising HYIP can receive links from the discussions in forums where potential investors exchange their opinion about HYIP programs. In addition, Similarweb traffic estimates show 1million of total visits since the launch of this project. Even though numbers are impressive, we will never find out the real data about investments made for Sport Arbitrage or any other programs. Therefore, don’t get swayed by the numbers. What does the administration have to say about the project progress? They have made the last announcement on March 17, 2017, saying that a few new languages have been added and it has brought to program news users from different countries. I just examined SimilarWeb report, which shows top 5 visitor countries – Russia, Japan, Vietnam, US, and Ukraine. Indeed, there is a language icon for almost all of them on Sport Arbitrage. Sounds great, but how about the investors? On the same announcement, the administrator claims 23 500 registered users and that they have not even reached the 10% of their maximum capacity. Unfortunately, no data available on Sport Arbitrage website about total investments and withdrawals. However, one website that collects data says it has around 60 thousand $ deposited. In the meanwhile, I can’t be too objective about the numbers, because it’s just a promotional announcement, in order to increase the number of investments. It’s important to monitor the progress of the program and see how your investment is doing any time and any place. Sport Arbitrage has announced the launch of Android and iOS apps in two weeks time. The announcement is already 7 days old, which means we should expect it by the end of the next week. Their website was already responsive compared to many other programs. However, they announced this feature as a response to over 50 requests to create an app. We see the growth of traffic, a continuous increase of Alexa Rank, an impressive amount of backlinks. However, the program has been online already for more than 50 days and there are only two possible options what’s going to happen next. First, they are so good at bookmaking that they can earn money for the program and us and this is going to last another while. Second, the great news about investors, a number of Twitter likes, backlinks to the website – these credibility factors are signs of the storm arriving. No matter, if you are a newbie or a pro, always keep it mind that any program is here to make a profit. Some of them manage to satisfy both sides – their own interests and ours, but others don’t. Find out how 1,000's of people like YOU are making a LIVING by staying home and are fulfilling their dreams right NOW.